Organizations with smaller IT teams know that keeping systems running on the right track—from protecting and running ERP systems to customer-facing digital channels, workforce management, Microsoft Office apps, and collaboration tools—can be a challenge. 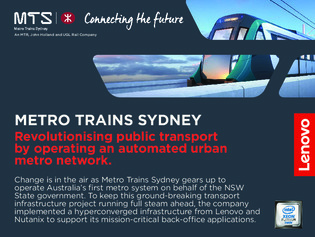 For example, Metro Trains Sydney (MTS) encountered the same situation when building out Australia’s first-ever metro system, where it was imperative that back-office operations run smoothly. Download this study to learn the operational advantages MTS realized by evolving its systems with hyper-converged infrastructure.